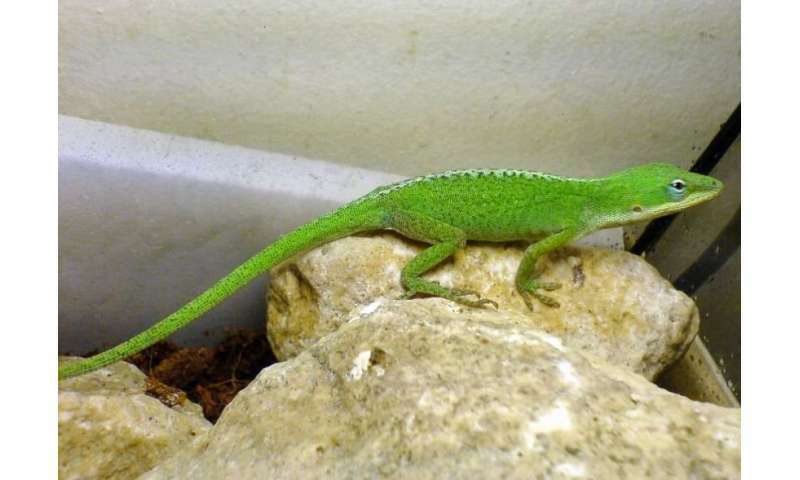 For more than a century, scientists have understood that natural selection have profound effects on how an animal looks—Anolis lizards that spend more time on the ground, for example, might need longer legs for running, while species that remain in the trees usually have shorter legs better suited for climbing. The first-of-its-kind study released small populations of lizards onto tiny, uninhabited islands in the Bahamas, and found that specific personality types—the very bold or the very shy—survived longer depending on whether predators were present. The study was described in a paper published earlier this year in Science. "As biologists, when we describe animals, we have the genetic part—what we call genotypes—and we have what we can see about the animal—what we call phenotypes," Lapiedra said. "Traditionally, when we think of phenotypes, we focus on morphology and physiology, but another important dimension of phenotype is behavior. Because behavior actually determines how animals interact with their environment, we expected it to be an important factor for animals to survive new ecological challenges. For instance, one would expect that behavior will play a relevant role in determining the survival of animals in the current context of global climate change." "But what happens when there are predators on the ground?" he continued. "Then you would expect the opposite to happen—the bold lizards would be killed more frequently. This is a very simple idea, but up until now, we didn't have evidence from nature that natural selection acted on individual variation in behavior." To test it, Lapiedra identified a number of tiny—only a few hundred square feet—islands in the Bahamas that had been scoured clean of lizards by recent hurricanes. "What we did was to simulate the process of natural colonization on these islands," Lapiedra said. "On eight islands, we released lizards that ranged from very bold to very shy. On four of the islands, we went back one week later and also released native ground predators, namely curly tailed lizards, so what we have are two scenarios—on four islands, the lizards can get as much food as they want, and they don't need to worry about predators on the ground. On those islands we expected the lizards who were more willing to take risks to survive and produce more offspring. "Traditionally, people have assumed an animal might be bold or shy depending on the situation, but as we are doing more research in this field, we are realizing that is not the case," Lapiedra said. "Researchers are increasingly finding that there are individuals that are always shy or others that are always bold." Unraveling how these behavioral traits emerge and change through time will help us understand how animals deal with changes in their environments—an idea of major importance in our rapidly changing Planet. "Natural selection is crucial for adaptation to new environmental challenges," Lapiedra said. "But the presence of natural selection per se does not imply evolution. What we have shown is that there is consistent variation in behavior. If there is heritability in behavior...lizards that are more bold would have more bold offspring. But so far, we don't have evidence for this. We can say that some phenotypes survive better than others in certain conditions...but that does not necessarily imply evolution." "We have two years of data already," he said. "From that we hope to be able to say if behavior is heritable or not, and if it's changing in one direction or not. So that would provide actual evidence for evolution in behavior—that would be a big step to unravel the role behavior plays in evolution."